If an advertisement is not SSL-enabled, we can not guarantee delivery on all channels. Ads should not be reproduced as endless loops (maximum 2 loops). Maximum animation lenght of 1 loop should be: 15 seconds. Advertising material for banners and redirects must be provided at least three working days before the campaign is launched and at least five working days for Rich media format. All commonly used data and Rich Media formats (except for sound) are used at heise online. 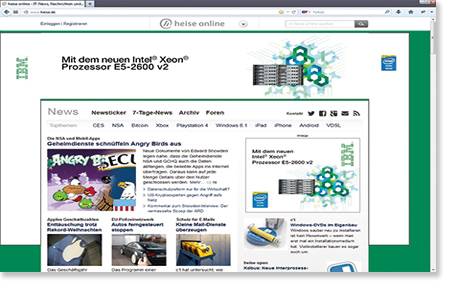 heise online uses dfp by Google as an ad server. Targeting is based on the time of day, the day of the week, operating system, browser, and "frequency campaign" at no extra charge.